Many businesses focus their resources on attracting new customers but forget to consider the customers they already have. This is a huge missed opportunity. Return customers are cheaper to retain than acquiring new customers and spend significantly more than new customers on average. Even businesses that recognize this frequently fail to retain their customers, to the end result that businesses lose 1.6 trillion dollars annually from customers that leave them! The key to retaining customers is to take a four-part approach, starting with identifying the values your business shares with your customers. Providing stellar customer service is also important, as it has always been. Next comes a modernized loyalty rewards program that incentivizes repeat visits from your customers. Last comes a newer, modern technique of taking innovative approaches to engage your customers and showing them that you care about their experience. 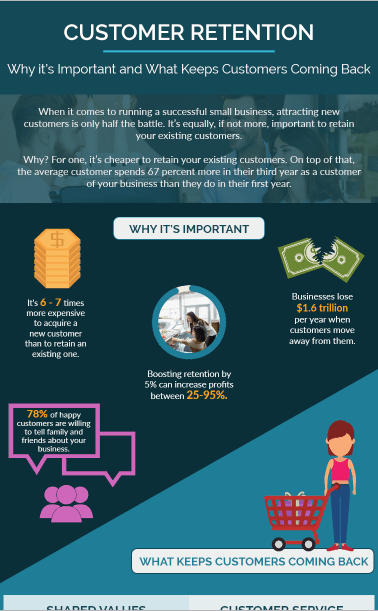 This infographic by SpotOn details why customer retention is so crucial and how to keep customers coming back.